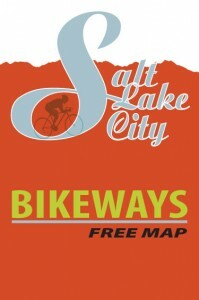 Dozens of miles of new bikeways, all-new cartography, and revised “tips” for bicycling in Salt Lake City are all featured on the new Salt Lake City Bikeways Map, released in mid-May during Utah Bike Week. Published by Salt Lake City and the Mayor’s Bicycle Advisory Committee (MBAC),the 24” x 36” map shows bike lanes, pathways including the Jordan River Parkway and Bonneville Shoreline Trail, designated bike routes, and quiet streets that are good for cycling. The map also identifies bridges and difficult intersections where cyclists should be extra cautious. Bicycle-specific amenities such as bike shops, bike lockers, and trail access points are shown. The new map is the first release since 2006.. The new text offers tips on commuting, sharing the road, route finding, bikes and transit, equipment choice and maintenance, along with bike route definitions and a welcome message from Salt Lake City Mayor Ralph Becker. Free copies of the map are available at all Salt Lake City bike shops. For those who want a more durable waterproof map, a version on plasticized paper is available for $4 at Fishers, Guthrie Bicycle, Bingham Cyclery, Wild Rose, Squatter’s Pub, Wasatch Touring, The Downtown Alliance, Saturday Cycles, Bicycle Center, and Salt Lake City Bicycle Co. Those businesses, Salt Lake City, and a Energy Efficiency and Conservation Block Grant from the U.S. Department of Energy supported the map printing cost. To obtain a PDF copy of the map or to learn more about Salt Lake City’s bicycle initiatives and the MBAC, visit slcgov.com/bike.